Slumped on the back of a packhorse on a mountain range headed into Afghanistan, I could see that the ground under our feet was getting increasingly dangerous. The higher we went, it was quickly obvious that the path was too narrow, too steep and too winding for me to ride any more. Carefully, I slid down from the packs on the horse’s back and started up the mountain behind it. My heart was pounding and I was gasping for air. We were now more than 10,000-feet above sea level but my guide and my horseman, Sayed Mohammad and Suffi Moussa, seemed to take every step with ease. In a moment, Suffi Moussa darted back behind me and pushed me closer to the horse. He then grabbed the tail and yanked on it. The horse seemed oblivious and the horseman placed the tail in my hands for me to use as a hoist. Finally, he looked at the horse and then at me and said grumpily, “Chew. Chew.” I wasn’t sure if he was driving the horse forward with his sound — or me. 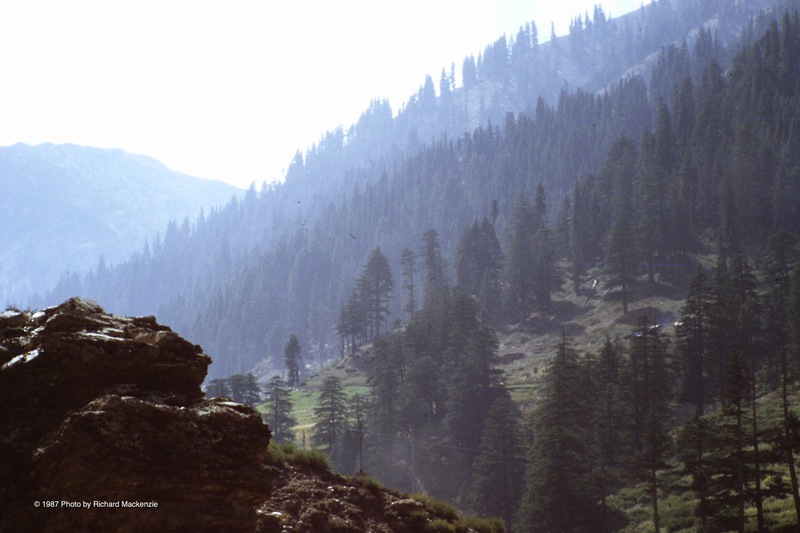 It was when we crested the mountain range from Pakistan into Afghanistan and started down that I could see where we were headed — into a mysterious and mythical place — Nuristan. Once called Kafiristan, the Land of the Kafirs or Infidels, it is undeniably one of the more isolated and inaccessible places on Earth. Comprised largely of mountains, Nuristan covers 5,000 square miles (13,000 square km) on the eastern edge of Afghanistan. Invaders since Alexander the Great have attempted to subdue this region but were always driven out. It was long a place of legend. This was the setting for Rudyard Kipling’s adventure, The Man Who Would Be King. It was a large part of Eric Newby’s travelog, A Short Walk in the Hindu Kush. The populace was forcibly converted to Islam in the late 19th Century. 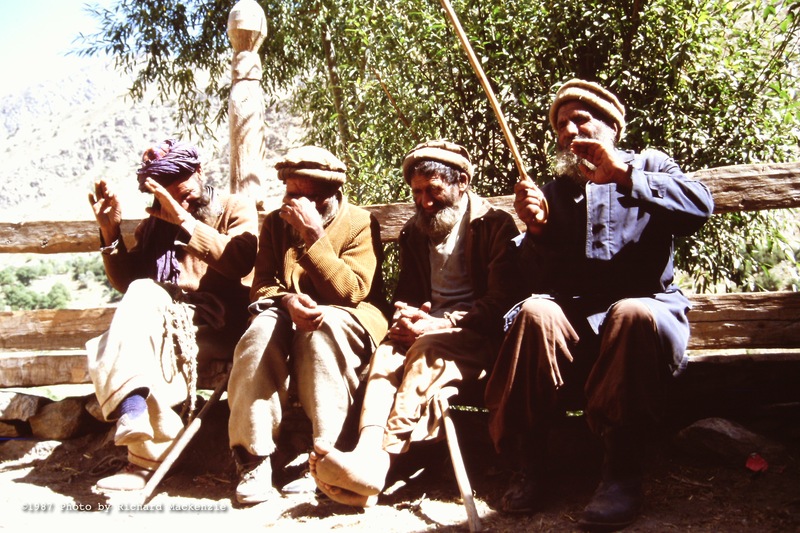 It was then that the region was first called Nuristan, the Land of the Enlightened. It is said that a significant part of the resistance war against the Soviet invasion of Afghanistan began here. As I arrived there in 1987, I felt that I was entering a South Asian paradise. The land was lush with vegetation. Luxuriously green trees cast idyllic shade. The air was pure. I had seen nothing like this since I first arrived in this part of the world. We were not alone on this route. 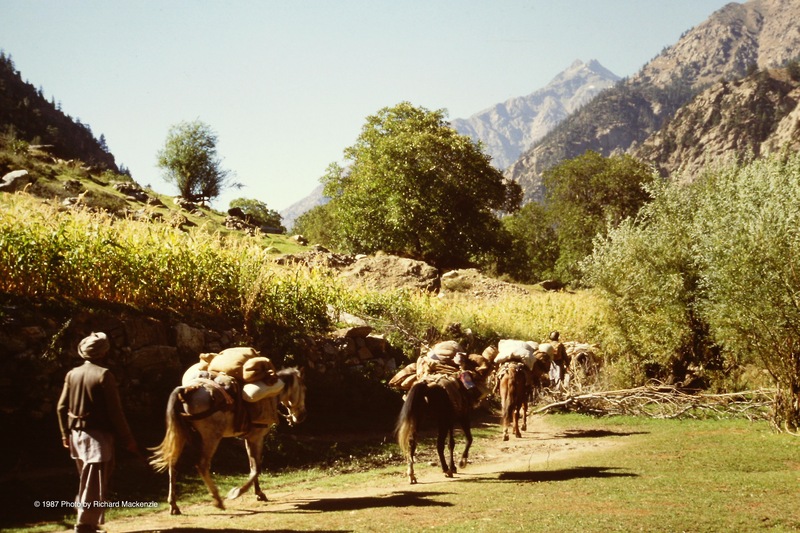 Dozens of other travelers were driving their pack animals through Nuristan on the way to other areas of Afghanistan, using this desolate path to avoid the Soviet Army or Communist Afghan forces. The trail we now followed ran beside a river and passed through small villages that seemed to cling to the sides of mountains. 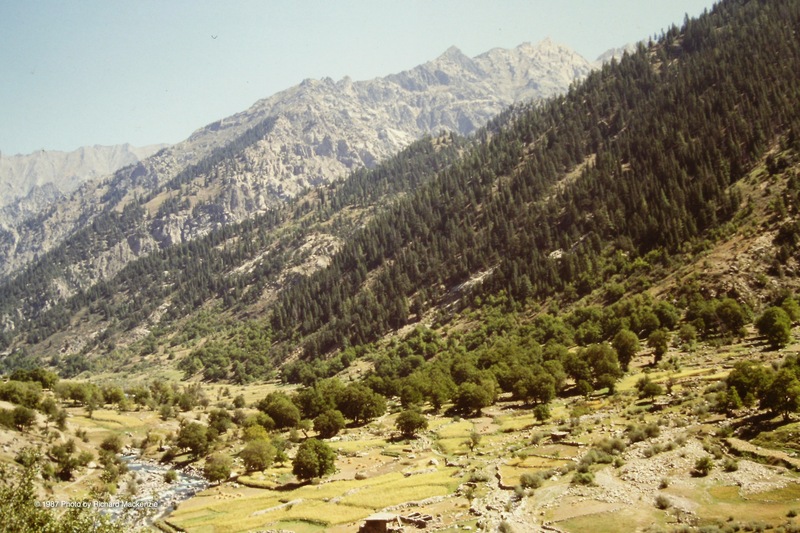 In Nuristan, building onto the mountains protects such villages from floods. The lower buildings house the animals and provide storage for crops while the upper buildings are for the residents. Our first overnight stop was also my first chaikhana, which literally translates as “tea house.” Like many, this chaikhana also provided lodging for wayfarers. They are generally a simple building, often just one or two rooms bare of furniture except for a giant stove in the middle, a dirt floor and a thatched roof. Travelers unload their horses in an adjoining yard or open space, then place their possessions inside before settling down in a corner for dinner — inevitably heavy with rice and endless cups of tea. The next morning, still fighting the food poisoning from Chitral, I drank and ate what I could: some tea and a fresh slice of Afghan bread. A little later, I wandered outside where I was welcomed by a group of old men, lounging in the early light. They were laughing together as I passed them and they invited me to sit. I gestured my thanks and waved toward the path that headed away from the chaikhana and deeper into Nuristan. They seemed to understand and I left them laughing in the morning mist. But I would never forget them. Early morning mist enshrouds a valley in Nuristan. 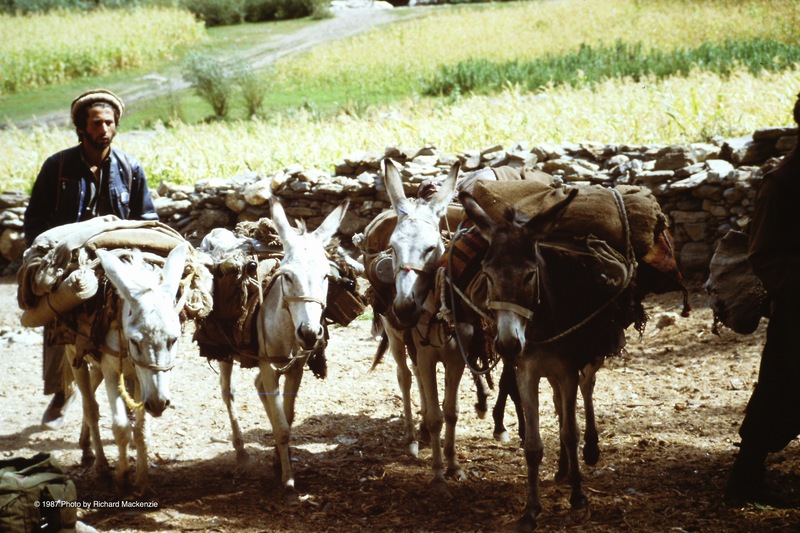 On the move in Nuristan — loaded donkeys bringing supplies. 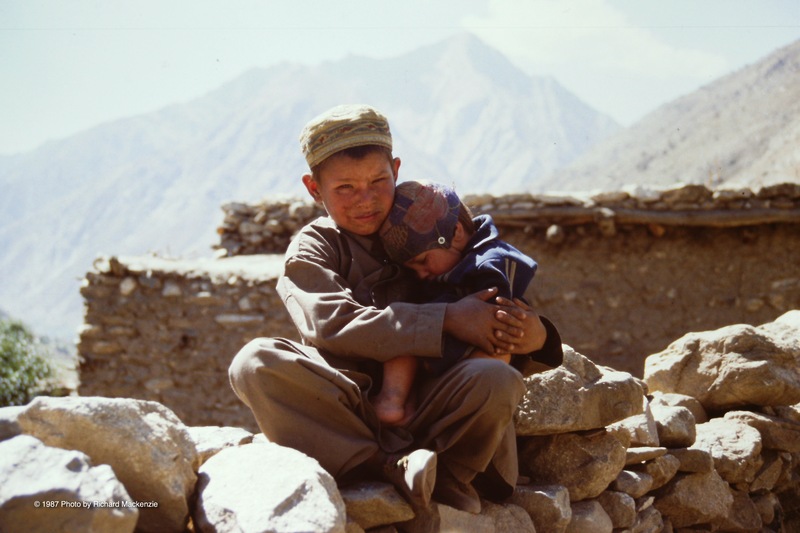 A young boy takes good care of his little brother in a Nuristan village. 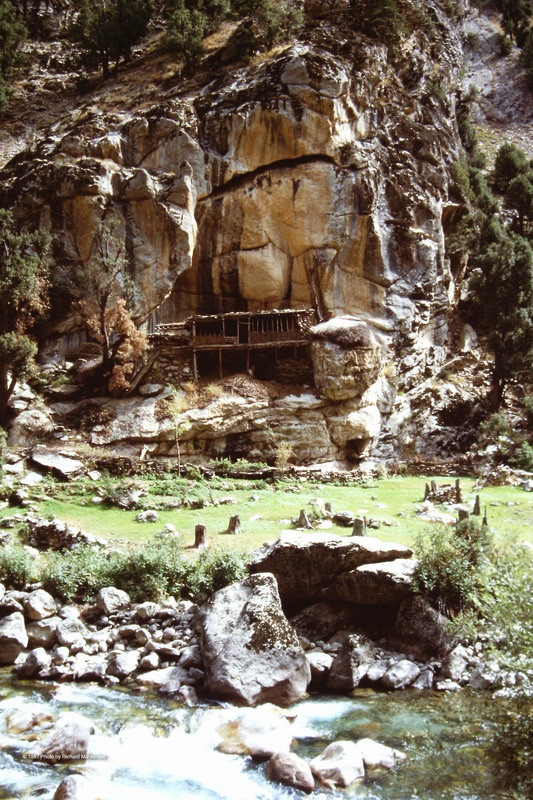 A lone house perched on the side of a mountain in Nuristan. 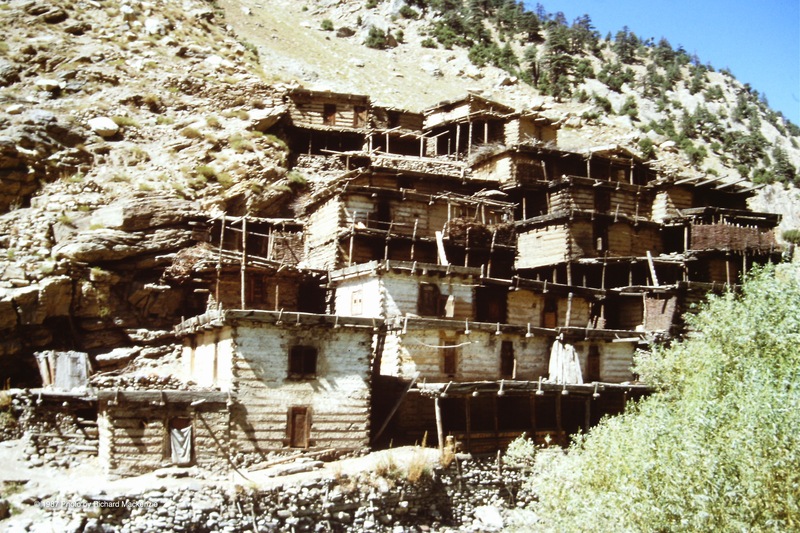 A community of houses in Nuristan — the upper buildings for people. Relaxing and laughing in the morning light — daily life in a magnificent land.